The use of airborne troops was first seriously considered for military operations just after WWI. US General Billy Mitchell organised a demonstration where six soldiers parachuted from a Martin Bomber, landed safely and in less than three minutes had their weapons assembled and ready. Although US observers dismissed the concept, Soviet and German observers were impressed with the demonstration. The Soviet Union took the idea and ran with it. Parachuting was introduced as a sport and military units were formed. By 1930 Soviet paratroopers were involved in military manoeuvres impressing the military leadership and by 1935 they could field two battalions. The world began to take notice and by the mid-1930’s several other European nations followed suit. The British organized parachute forces in 1936 and used them in their manoeuvres. It was the Germans who fully embraced the concept. They began to train paratroopers and glider-borne soldiers for mass operations. 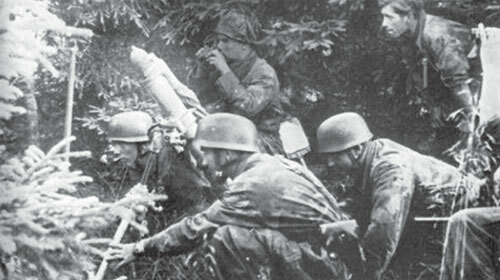 Germany’s first used airborne forces in combat in 1940 during the invasions of Norway, Denmark and the Netherlands. 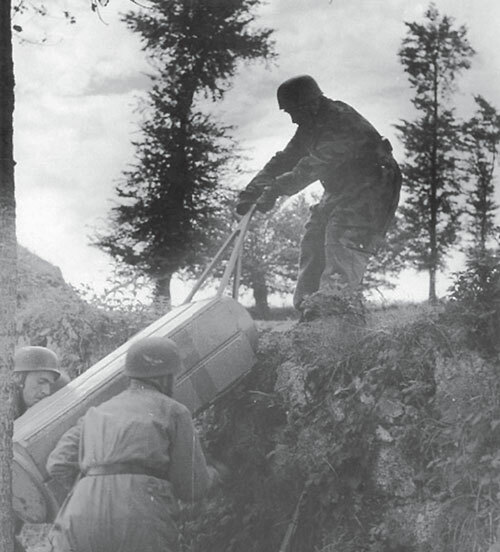 Paratroopers were used to seize several key objectives until reinforcing ground troops arrived. In Belgium a handful of glider-borne troops landed on Belgian border fortress of Eben Emael on 10 May 1940. They seized this most important anchor in the Belgian defence line, easing the way for the invasion of France. gliders and paratroopers at four separate locations, three of which were airfields that could ensure the arrival of air-landed reinforcements. A vicious battle ensued, with three of the four air-landed forces being virtually destroyed. German reinforcements were poured in through the one remaining airfield and another sea-landing through this bridgehead met with greater success. However, this success did not come without cost, the Germans suffered 6,700 casualties out of a total force of 25,000. This loss of so many elite troops dampened German enthusiasm for airborne assaults and Hitler decided that airborne assaults were far too costly. Impressed with the early success of the Germans, the Allies decided that airborne operations were a powerful tool. The Germans had bypassed 100 miles (160km) of British-controlled waters to seize Crete from a larger ground force. The Allies began to invest heavily in creating airborne units. In April 1940, the US finally approved plans for the formation of a test platoon of airborne Infantry. On 29 August the platoon made the first platoon jump held in the United States. This successful jump led to the creation of a force of more than 100,000 paratroopers that fought in every theatre during World War II. By the end of World War II the US had used airborne troops in fourteen major offensives and dozens of smaller operations. 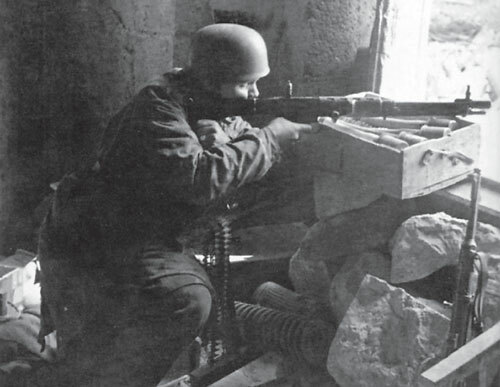 US airborne forces mounted major assaults in Sicily in July 1943, Normandy in June 1944, Southern France in August 1944, and across the Rhine in March 1945. Smaller American airborne Airborne landings occurred in North Africa in 1942 and in the Pacific. British airborne troops also saw action in Tunisia and Sicily. 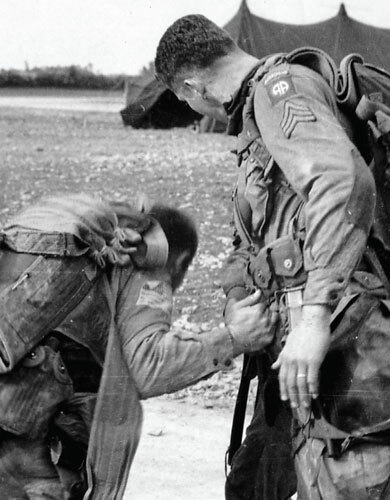 In Tunisia, the 2nd Parachute Battalion dropped on an airfield at Depienne. The airfield was found to be abandoned and supporting troops never arrived, leaving the paratroops to fight their way back to Allied lines across 50 miles (80km) of enemy-held territory. The 3rd Battalion successfully captured the airfield at Bône and fought on in Tunisia as line infantry. In Sicily the British launched their first major airborne operation of the war to start Operation Husky. Bad weather and friendly anti-aircraft fire meant that many of the gliders of the 1st Airlanding Brigade never made it to their landing zone, and most of the gliders were scattered or lost at sea. However, two gliders did arrive within 5 miles (8km) of the landing target, the Ponte Grande (Great Bridge). The bridge was taken, but quickly lost to counterattack, before the ground forces of the Eighth Army arrived to relieve the paratroopers and retake the bridge. Two days later a second operation was conducted to take a bridge further north, the Ponte Primosole. This time it was the 1st Parachute Brigade’s turn. Once again friendly fire scattered the aircraft and gliders. 295 men made it to the bridge only to have to hold off tenacious counterattacks by 3. Fallschirmjägerregiment (the German 3rd Parachute Regiment, tough veterans of Crete) who had dropped in the area the previous day as part of the German reinforcement of Sicily. Once again the Eighth Army rescued the airborne troops retaking the bridge. The most famous airborne operations involving Allied airborne forces were Normandy and Operation Market Garden. In Normandy, US, British and Canadian airborne troops were dropped behind the German beach defences. The airborne troops seized a number of key objectives and although not always successful, the landings proved crucial in confusing and delaying the German defenders, securing key bridges and crossroads. Operation Market Garden was launched in September 1944. Over a period of six days almost 35,000 Allied soldiers dropped or landed in the battle areas along a corridor linking Eindhoven, Nijmegen, and Arnhem in the southern Netherlands. The British 1st Airborne Division, after initial success, soon found itself isolated. For seven days weather hampered the air-drop of supplies while the paratroopers held off German counterattacks. Eight days after the British paratroopers landed British armour finally broke through and allowed some to escape.